Here is an absolutely amazing new large reef tank by Vivadi. 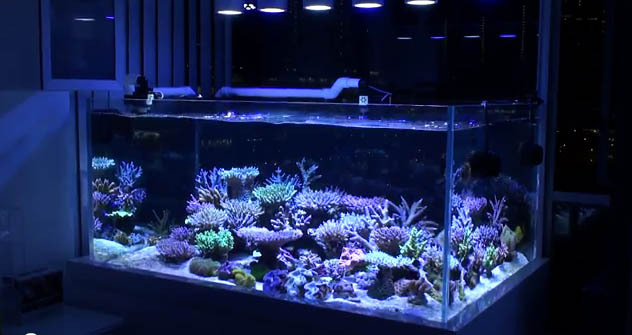 We have arranged the video in chronological order, so that you can follow the progress of this beautiful new reef. With a total system volume of approximately 800L, this reef has a relatively minimalistic aquascaping, leaving plenty of room for fish to swim and coral growth. As the video series progresses, you can see that a nice selection of fish has been added, as well as a variety of corals. Some very large SPS colonies have been introduced, looks like Vivadi doesn’t mess around with frags. The 5 EcoXotic Cannons do a great job at lighting this tank. You can see that although there are 3 white and 2 blue cannons, the color is blended together quite well, and the result is quite pleasing. Outstanding flow is provided by 3 Vortech MP40ES, and 2 Vertex Moceans. Now, when you get to the March 20th update, you may drool on your desk. It seems as if the tank has gone under some sort of pest infestation. That would be true, if SPS was a pest. The tank is now packed with large colonies, and looks stunning. The combination of tableling and branching corals, together with great color, yields what we could only hope was ViVadi’s vision. Vivadi, you did an incredible job! Stay put for more updates, and please share this.